There are many people in the city of Denver or the surrounding communities of Wheat Ridge and Lakewood that do not know that chiropractic care is utilized often for jaw pain and TMJ/TMD conditions. These conditions can be extremely aggravating since we use our jaw or TMJ joint extensively throughout the day. Our Denver chiropractor offers a non-invasive treatment that can be the best option for certain TMJ conditions. It is important to find a chiropractor that treats this special joint since not all chiropractors, dentists, and other practitioners are experienced with working with the jaw. Our chiropractic clinic near Denver and Wheat Ridge can coordinate care with other specialties, including dentists, to create a treatment plan for your TMJ or jaw pain condition. 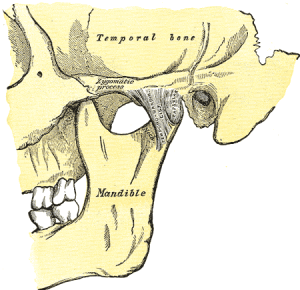 The temporomandibular joint is a specialized joint directly in front of the ear and allows movement of the jaw. It’s a unique joint in the body and can present with some unique problems. Many things can cause someone to experience TMJ disorder or jaw pain including acute trauma or physical impact to the jaw, daily stress, teeth grinding, and even extensive dental work due to the mouth being open for extended periods of time. Most dentists today understand this and take proper precautions during treatment to reduce chances of creating any jaw pain. There are other causes that can contribute to TMJ jaw pain and our office performs a comprehensive exam to find an accurate diagnosis and referrals (if necessary) to dentists or specialists can be made at that time. Pain that is located directly in front of the ear, near the temples, or down the jaw line towards the face. This pain may or may not travel or radiate to different locations at times. Inability to open the jaw wide or problems with the jaw locking in an open or closed position. Clicking or grinding during movement of the jaw or chewing food. Problems with alignment of the upper and lower teeth and feeling like they do not line up correctly. These symptoms may initially come and go occasionally but can be constant and chronic. TMJ disorder can be an extremely frustrating condition and it is important to get checked by a chiropractor who has experience with this joint. Our office performs a comprehensive exam to find the best possible non-invasive treatment methods which may include massage, myofascial release, specific exercises, light force adjustments, and at-home directions to reduce pain. Contact our office today at 720-242-6251 or schedule online today!